This from the Melody Bar and Grill website, "...As Westchester's premier local Bar and Grill we offer up some of the best fare around. We pride ourselves with serving fresh local produce and premium natural meats. Chef de cuisine owner Christian Warren has created a menu that has been coined “Gastrodive”..." These were tall words coming from the former biker bar, across from the In 'n' Out, on the way to the airport. Still, The Marinater had a Groupon, and I truly had nothing else to do on that particular afternoon. Besides, The Marinater can be good company if you can get past the fact the he keeps change for the parking meter behind his eye patch. We walked into a bustling establishment at around 2 in the afternoon. It wasn't the usual bar crowd, either. This was a dining room full of diners....not a bad sign. We ordered a couple of burgers, and our meals arrived in about 12 minutes. During our meal Mr. Warren came out and discussed the food with us. We were refreshed to talk burgers with a chef so passionate about quality, variety, and innovation when it came to American Comfort food. 7 kinds of Mac and Cheese...Cheeseburger Potstickers...onions caramelized in peach syrup. The atmosphere was very kid friendly, and Mr. Warren's young daughter detached herself from his hip to snag a few fries from my plate--she was adorable. The Beef: Hooray! 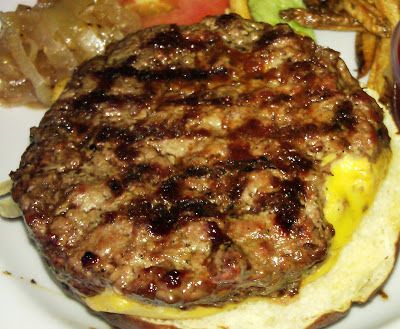 The burger beef at Melody Bar and Grill was sourced from Rocker Brothers. The custom blend of NY Strip, Short Rib, and Sirloin was ground and blended by the purveyor. The fat content in the 7 ounce burger patties was 20%. The burgers just tasted like steak. They were strongly beefy. There was a medium note of aged funk. There were strong notes of blood and some other subtle mineral notes. The grind was coarse, so one was kept mindful that one was masticating a mouthful of quality steak cuts. The bite was loose, but the components were firm, and this struck a perfect and juicy balance. The beef bordered on perfection. The Seasoning: The exterior of the burgers at Melody Bar and Grill were hit with just enough salt to make the flavors of the beef pop. The Sear: The sear on the cheeseburger came courtesy of a properly hot, cast-iron grated, gas-fired grill. The sear wasn't amazing but it was adequate to impart the expected flavors and textures. The Preparation: We ordered Med-Rare burgers, and we were handed Med-Rare burgers. The burger patties were formed, by hand, during the prep cycle. The high-quality ingredients were treated with care and respect. There was no sign of over-manipulation of the patties. The burgers were turned 3 times during the cooking process. I would have preferred a single flip to allow a better sear to develop, but the burgers turned out really well, nonetheless. The Cheese: The cheese choices at Melody Bar and Grill were Swiss, Goat, Gorgonzola, Cheddar, and American. My burger was draped in a perfectly melted slice of American cheese. The cheese provided just the right amount of creaminess and richness to round out the bite. The Bun: The bun was a Pretzel bun from Rockenwagner Bakery. The bun worked. It was fresh, soft, savory, and properly toasted to deliver some crunch with every bite. Pretzel buns can work, but they have to be fresh. Otherwise the chewiness can detract from the dish. 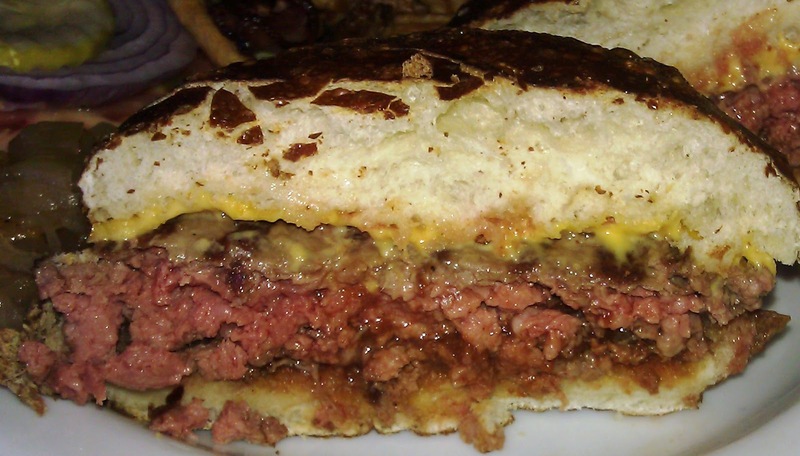 The Meat To Bun Ratio: Perfection. The Toppings: The Iceberg lettuce was sweet and crisp. The tomato slices were on the mealy side, but that was forgivable in the light of the excellent quality experienced throughout the meal. The bacon on the burger was thick, crisp, and smokey. The Fries: The hand-cut, peel-on, par-cooked fries were reminiscent of what I have come to enjoy at Five Guys Burgers and Fries. The fries were crisp, well-cooked, creamy in the centers, and properly seasoned with salt and oregano. The fries were a winner. The Value: At 10 bucks for two burgers (Groupon), the value was stunning. 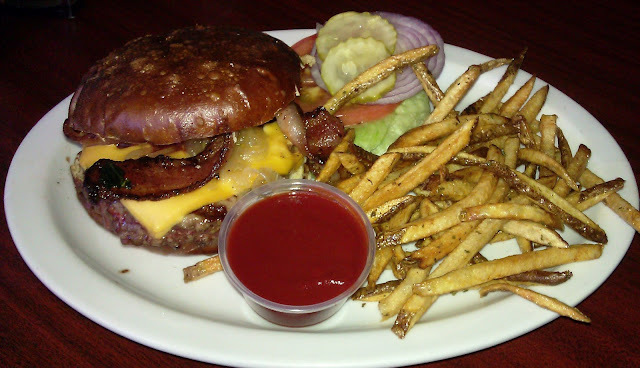 At 10 bucks for a high-quality burger and a pile of fries, the cheeseburger value was good at Melody Bar and Grill. 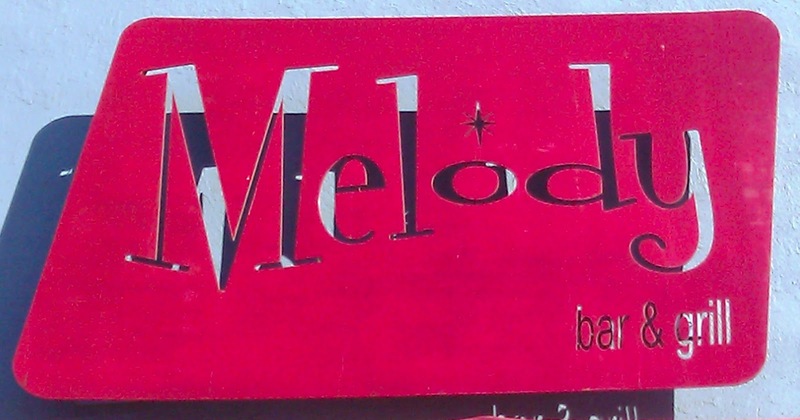 Melody Bar and Grill was first opened in 1952. It had a long history...Elvis and his mother once had lunch in the booth next to mine. Later, the establishment became a windowless biker bar. More recently, the former owners of Ma'Kai in Santa Monica transformed the restaurant into something better than it had to be. There would have been plenty of patrons at the establishment killing time before flights at nearby LAX. Still, Chef Warren brought his A-game and served up thoughtfully innovative versions of American Comfort food at great prices. P.S. since Ma'Kai Lounge traded hands, the wheels have fallen of in terms of customer experience. Burger Review : An excellent cheeseburger at a fair price. I will return to try those Cheeseburger Potstickers, though.